Urban food production has recently been identified as a potential new cluster for Singapore, building on the rapid growth of agricultural technologies which are the intersection of food production with advanced technologies. Clusters are geographic concentrations of interconnected companies, specialized suppliers, service providers, firms in related industries, and associated institutions in particular fields that compete but also cooperate. Singapore has succeeded previously in developing clusters for industries such as petrochemicals, water, and biomedical services, increasing productivity growth and production capacity in these sectors. However, apart from productivity growth and production capacity expansion, as was achieved by past clusters, the urban food cluster will also seek to contribute to higher levels of food self-sufficiency and food security in the city-state. 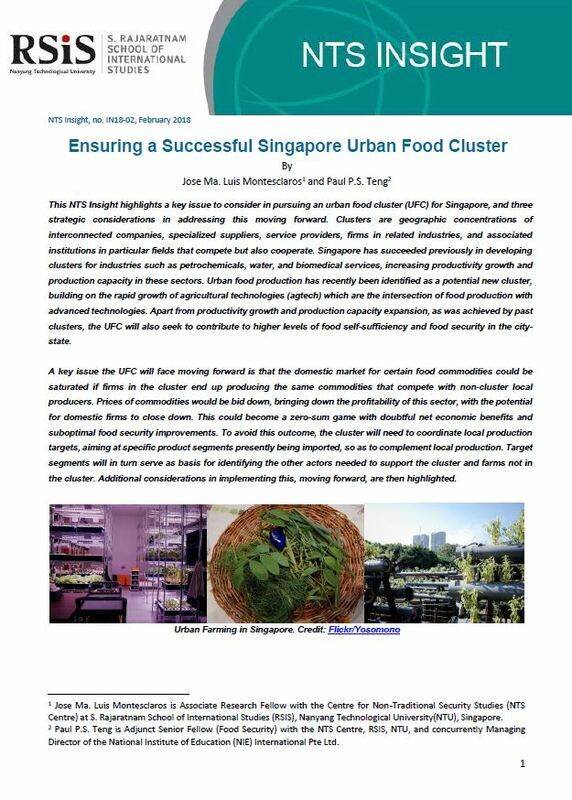 This NTS Insight highlights a key issue and three strategic considerations in pursuing an urban food cluster for Singapore.